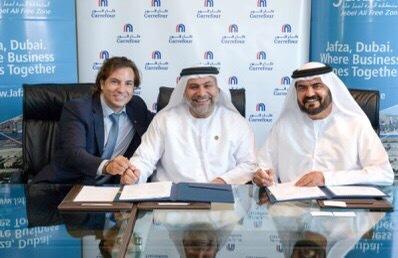 Majid Al Futtaim, a leading shopping mall, retail and leisure pioneer, will open a major new distribution centre for Carrefour at the National Industries Park (NIP) in Dubai, UAE. The centre, once operational, will be the largest and most advanced distribution hub of its kind for Carrefour in the region, said a statement from the company. The facility is constructed on a land area of 1.5 million sq ft and covers a built-up area of over 800,000 square feet, almost four times the size of Carrefour’s current largest distribution centre building in the region, it said. The centre will also feature advanced warehousing, storage and logistics technologies, it added. The multi-temperature storage at the new distribution centre is designed to meet the storage needs of the different food types including fruits, vegetables, meat and dry foods as well as warehousing for non-food goods. With a total storage capacity of over 400 million units, the new distribution hub is expected to save over 50 per cent energy per cubic metre and manage more than 150000 orders per day to support Carrefour’s brick and mortar stores in addition to the omni-channel business of Carrefour, said a statement. “We continue to look at the Middle East and North Africa as one of the key growth regions for Carrefour and one that we will continue to invest in over the coming years. We are confident that this new facility will help us deliver even better quality of products and services to our customers,” he added. “As part of our company’s vision, we are committed to constantly improving our operational facilities and capabilities for delivering high value to our customers in the UAE and other operating markets,” he said. “In addition to being our largest distribution centre in the region, the facility at NIP is also highly energy efficient and will help us become more environmentally friendly, while reducing the overall carbon footprint of our stores,” he added. “The company is renowned regionally and globally for their pioneering contribution to the retail and leisure industry and we are confident of providing Majid Al Futtaim with distinctive logistic solutions that meet their requirements for various markets,” he said. Posted on January 4, 2017, in Other. Bookmark the permalink. Leave a comment.